I'm not big on resolutions. However, I love a project. I might get overwhelmed with all the things I should do, but having a list of things I want to do, puts it all in perspective. With my birthday in June, I like to stick with 6 month projects: short enough to finish and with the endpoint clearly in focus. The key, for me, is listing each of the small steps it takes to get to the completed project. At my birthday, I reassess and come up with all new projects for the next 6 months (or, if I'm happy with the old projects, I stick with 'em)! Knit a sweater and pair of socks, for myself. Growing up, we gave Christmas cookies as gifts to anyone not closely related. Starting at Thanksgiving, my mom and I would start making the longer-lasting cookies (or making sugar-cookie dough and freezing it for later rolling and baking). We'd go to church the Sunday before Christmas, loaded down with tins filled with a variety of cookies, wrapped in ribbons, tagged for everyone we knew (luckily, it was a small church). As I grew older and my younger brothers and cousins were born, we started holding annual Cookie Parties: days filled 4 little boys kept busy rolling, decorating, baking and sugar rushes for all. Most of cookies from these years were best given to parents who could appreciate the ‘skill' of the decorator. Now that I live hours away from my family, I miss a house filled with cookie smells and countertops that are as piled with cookies as the sidewalks with snow. Last year Mom waited to have the Cookie Party until I was home to help, but this year the boys are older (7 & 8) and they wanted to have their friends over, so they're forging on without me. I'm also feeling the tug to create my own memories, with my own little family. For the first time ever, Jay wanted to contribute to our Handmade gifts, so as we sat down for a ‘planning meeting' last weekend. I was overjoyed that he thought cookies would be a fantastic gift for his family that we're visiting next week! I immediately started jotting down all the cookies I wanted to make (chocolate chip, decorated sugar cookies, snowballs, brownies, 7-layer cookie bars…) and then it hit us: his family is diabetic. They can have a little sugar (they love my apple pie), but a whole tin of cookies? At least some of them need to be sugar-less. This is a test of our creativity, since, as Sister Diane writes, sugar does a lot more than just sweeten the cookies. All of my Google-skillz are being tested as I search for sugar-free cookie recipes, but I'm not happy with the quality of the recipes I'm coming up with. Clapotis for Mom, out of Mati Hari Spinnery's Seasilk yarn, dyed by me. The gorgeous fibers I got in from (again) Mati Hari Spinnery. Seasilk and merino; I dyed it last week and will spin it up and knit into something for Mom this week, probably handwarmers to match the scarf, or maybe a hat. Me and Hub are sewing Star Wars Cloaks for my little brothers (like this). It's fun to have a project for both of us and it's good sewing practice. Speaking of sewing practice, I'm loving the book Sew U.
I'm dyeing to make a neckwarmer like Grumperina's. I am honored to be interviewed by the Dharma Design blog, as a Featured Artist! You can read the article here. I found the blog and shop through an Etsy forum and am so glad to have discovered her beautiful jewelry. I really love the photographs of her work and her jewelry is really unique. Do you have any favorite interviews? Is there someone (or some type of artist) that you'd like to see/read interviewed that hasn't been? I find inspiration all around me on good days. On not-so-good days, I often wish I knew where to go for an inspiration fix. So, a new weekly feature: Weekly Inspirations. It's my hope to post, on Mondays, those things that are inspiring me today. I'd love to know what inspires others, so please comment, or post your list to your own blog! Elf – the colors, the music, the mood, the illustrations and especially Elf's outfit and those wondrous snowflakes! Jay's extended family is huge (15 Aunts and Uncles + spouses + kids) and we just don't want to mindlessly contribute to the masses of gifts they're all getting each other, so we give tins of cookies or handmade ornaments. I'm not sure they entirely appreciate it, but after 3 years, they accept it. Same goes for my Dad and Step-mom. Together we make something for his parents (handpainted cookery, pictures in frames). I also try to make a handmade ornament to use in place of a gift tag for every gift I give. One year it was little hats, last year it was beaded wire snowflakes. There's at least one ‘required' gift for co-workers (in every office we've worked in, we've insisted on a name-drawing and just give to ONE person). This just can't be avoided and I'll address the problem of buying a gift for someone you might not know anything about during the Handmade Gift Guide. The above system not only saves money, it's a great way to avoid contributing to the commercialization of the holidays and it requires us to think and plan and make together. Even with the small gift list, this time of year always feels like creative overload for me. So many things to make, so many tutorials to read and new things to try. And that's just for gifts. Gift wrapping is something I love, but I never feel I truly succeed in getting it just right. Tree decorating is a whole other creative endevour: finding old ornaments, making new ones. And Baking: cakes and breads and iced cookies. Yum! Sometimes there are so many things on the To-Create that I get overwhelmed. This year, in an effort to avoid that, I'm going to learn to be ok with buying something handmade. The gift must be handmade (or produced by a small business) or be something you could handmake in a short amount of time. On the final day, I'll list gift-wrapping tutorials and links to Handmade gift wrap. Oh and many many stores on Etsy are having sales (or free shipping) this weekend, Friday – Monday, to kick off the Holiday Season. Just search “cybersale” to find all of the sales! Ok, first of all, it's hard for me to talk about *mojo* without using my Austin Powers voice (yeah, baby) but my loved ones don't find that funny, so I'll resist (oh, behave). But in reality, I am feeling the mojo. I've been reading, devouring, savoring Brenda Ueland's If You Want to Write a little bit each day, journaling my impressions. That bit about resting in a creative idle, well it really sunk in and started to work some magic in my creative life. After a weekend of emptying list of ‘shoulds' and ‘musts' .. I woke up with a buzz Sunday morning. I had a burning desire to create, to make, to flow. Luckily there's a stash of yarn next to my bed, so I grabbed the first ball and needles I found and just started knitting. It doesn't matter what I knit, or even that I knit…but what matters, what really spoke to me, was that I wanted to. I had bemoaned that my interests and inspirations never make that jump into passion-in-action but through reading this book, I realized that it was because I wasn't showing up for it. Brenda (we're on a first name basis, now) encourages the writer (or artist or whatever) to show up everyday, ready to write, ready to create. I had been feeling inspired, but I wasn't commiting to showing up whether inspiration struck or not. Just the commitment itself has become inspiration, spurring me on to action. I am besot with pincushions. 1. three + three, 2. yet another, 3. cat pincushion, 4. bird nest 2 003, 5. Zingy!, 6. Donut Strawberry Erdbeer Pincushion, 7. red ladybird, 8. 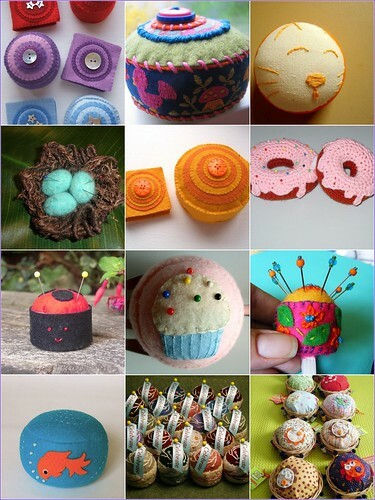 Cupcake Pincushion (bottlecap), 9. bottlecap pincushion, 10. koi pincushion, 11. custom order for fgantner, 12. Festival de alfineteiros! edited to add: All of those pincushions inspired me to try my hand at my own. I used Purl's tutorial…but only as a rough guide. I cut the fabric a little too small, and my pincushion is minuscule. The dog added himself for scale, but keep in mind, he's little! Hello, my name is Tara, I am a creator. I have entrepreneurial aspirations and a degree in French. But my current passion is creativity. It's a word that's used so much, maybe overused, but the concept fascinates me. As for my own creative and entrepreneurial endeavors, in July 06 I launched Blonde Chicken Boutique. 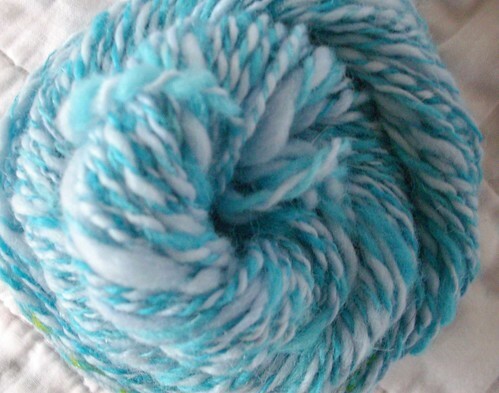 I started by selling handpainted earth-friendly yarns on my website. I limited my suppliers to those who could assure me that the yarn was created from either recycled or organic materials because it's important that my monetary choices reflect my beliefs. I focused more efforts on spinning than on dyeing and have researched eco-friendly yarns which are still incredibly hard to source. When I’m looking at a yarn, I consider it’s impact on the environment in it’s creation (the sheep’s environment or if it uses recycled material) and in it’s distribution (if it has to be shipped from across the globe). 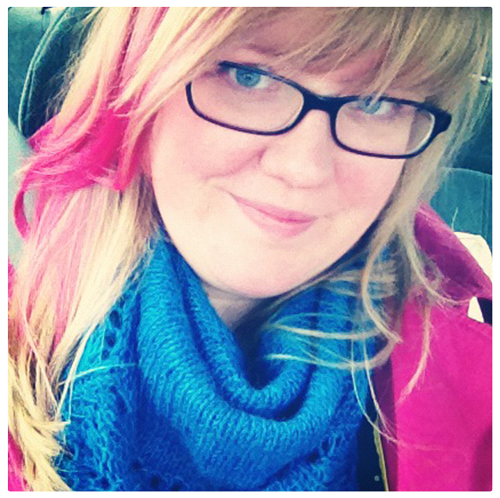 This has led me to cut back on the whole “sourcing” thing and focus on finding local resources and low-impact dyeing. During this period of research, I stopped selling dyed yarn online, for a few months, in order to properly keep up with my local orders, as I was asked to sell handpainted and handspun yarns at the local art gallery and supply shop. In conjunction with this, I held knitting and spinning demonstrations at the monthly gallery nights in March and April. Just last week, I posted some yarn online for sale, on our Etsy site. Personally, I’ve gone through some changes too. We opened the shop just 15 days after moving to a new state and a new life. In the interim, my husband has become a full-time student. I changed ‘careers’ (if you can call 2 years out of college a ‘career’) and now work in an office: 8-5. I’m employed by the University that my husband attends, and as a benefit I can to take classes for free. I’m currently enrolled in Pre-MBA programs and am researching the possibility of entering an MBA program next fall. More than all that, I’ve spent the last year searching and pursuing a definition of what it is I want to be doing with my life. I went through some times of deep confusion and real frustration. I spent much of my free time reading and writing and talking, and my knitting, spinning, dyeing and designing all fell behind. After all this, I still don’t know what I want to be ‘when I grow up’, but I do feel a real sense of purpose before along with a bit of clarity about what I want from BCB and from this blog. Literature, Theology, Language, Art, Craft, History, yes: even Business: they are all about humanity’s innate desire to be creative and to express one’s view of the world. The activities I enjoy also reflect this desire for learning and expression: creating (spinning, knitting, writing, dyeing); researching, analyzing, talking. The area of Business may not seem to fit in, but trust me, it does: what is an entrepreneur doing but creating something that acts as a reflection or extension of herself? So, my new mission is to stop obsessing over what I’m going to be doing, what I should be doing and just start researching the things I love, analyzing what I find and sharing it here. I hope to share the books I’m reading, interview people who’s creative careers I admire, study some history of creativity and the history of crafts.